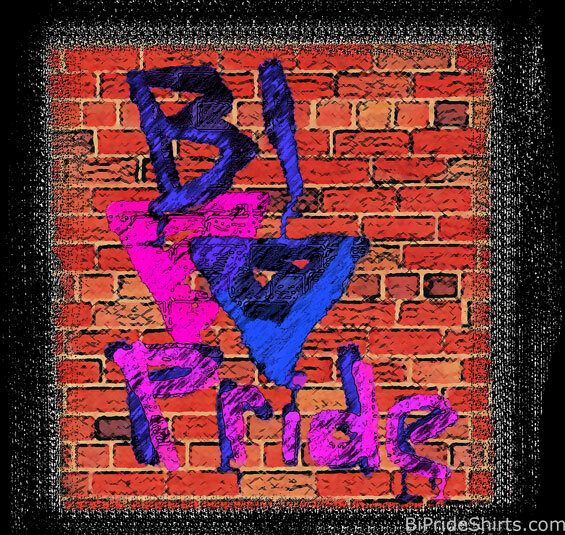 Digitized tagging of the bi pride double triangles symbols and the words bi pride on a brick wall. A visual combo of computer generation angst and spray paint style raging against the system of proscribed bi erasure and biphobia. 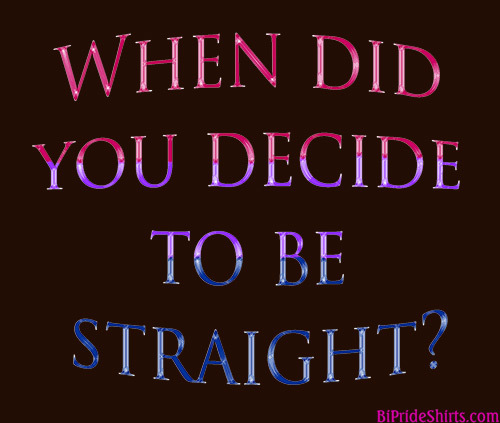 When did you decide to be straight? It is pretty common for straight people to ask bisexuals when they “decided” to become bisexual. “When did you become bi?” or “When did you decide to turn bi?” are a couple of other ways I have had this question asked. What many straight people don’t understand is that nobody really chooses to be bisexual, homosexual, transgender, etc… In fact it is often a struggle to come to grips with being different from culture’s norm for most people who identify as LGBTQ. It is never really a choice to find attraction in someone. It just is. We are made that way. That question thrown back at them often makes them think. It can make a person realize they never decided. It makes them realize that was just how it always was for them, so it is most likely the same for you. They never decided. That is the answer. So maybe you are tired of hearing such questions. Maybe you are tired of just knowing people think those questions. 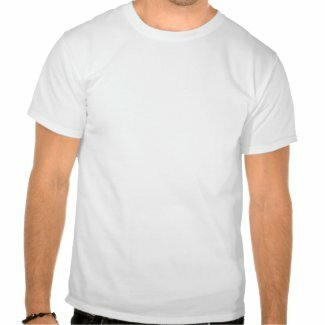 Either way, here is a shirt for you. Big words done with a subtle use of the bi pride flag colors. 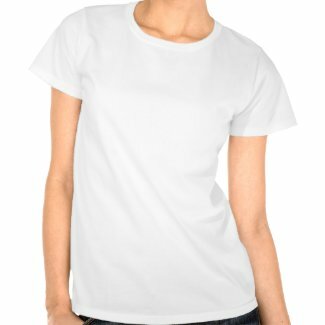 Available in multiple styles and colors! 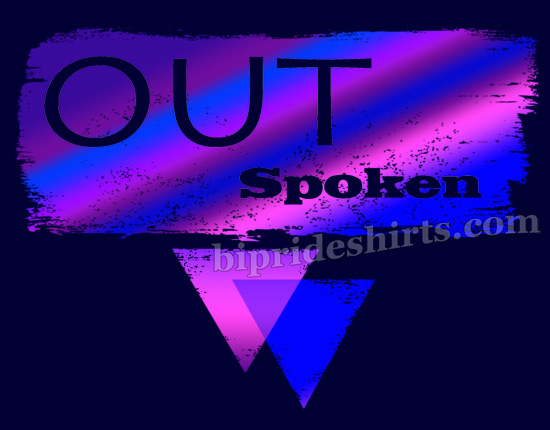 Show your colors in a classy way with this design that is both an in your face statement to those who practice bi-erasure and have bi-phobic tendencies, yet is just a simple pride statement to those who are your allies, friends, and to fellow bisexuals. 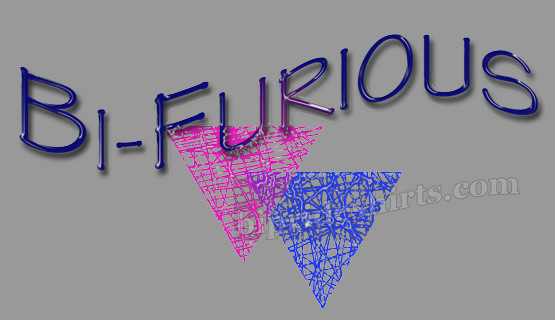 We have two different versions of this BI-FURIOUS design. The first one is a bit bolder and more in your face than the second, but both get the point across. 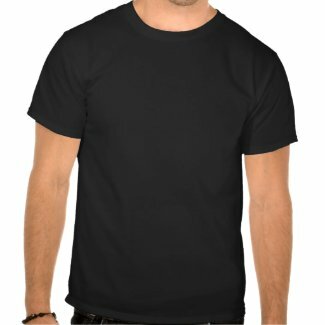 The wearer of this shirt is BI-FURIOUS! 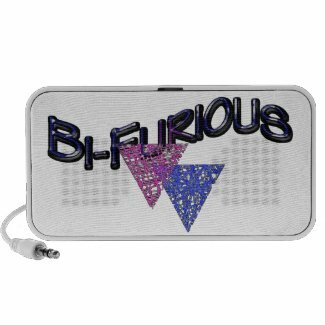 There are a few of you out in internet land who may have stumbled onto this page who don’t know what being BI-FURIOUS means. It is actually a term used in a couple of ways, but the most common one is what made us make this shirt design. You see… some people claim that bisexuality doesn’t even exist. Some people think it is a phase. Some people claim girls are bisexual only for attention or that guys claim bisexuality just to not commit to being 100% homosexual. Straight people often consider bisexuals gay while homosexuals consider bisexuals to be straight or “sitting on a fence,” unwilling to make a choice. Many of these people (heterosexuals and homosexuals) almost demand that bisexuals chose one or the other. They want us to pick a side and stick to it. Pop media loves to talk about gays and lesbians, but refuses to acknowledge bisexuals. If a bisexual accomplishes something amazing they are labeled gay or lesbian in the news. The list of wrongs goes on and on, and it makes some self identified bisexuals a tad angry. It makes some bisexuals really pissed. Every once and a while the bisexual erasure, stereotyping, and rude behavior of ignorant people suffering from nasty cases of biphobia can make a self assured bisexual become furious. BI-FURIOUS! That is what set us to making this design. Now the other (though much less common) use of the term is a self identifying one also. Though the majority of people who identify as bi are quite happy being with either their own gender or another gender, some people who identify as bisexual want or need both at the same time to feel complete or satisfied. Most often people who call themselves bi-furious for this reason are more physically focused than emotionally focused in their desires. 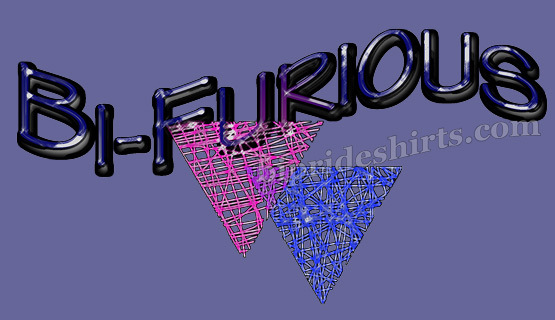 However you look at it… It is a great shirt design and and perfect for anyone who is BI-FURIOUS. This awesome design is also available on a portable mini speaker. I love this shirt design. 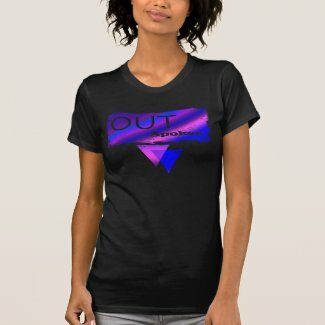 This was originally made for a very outspoken and very out bisexual to wear to a pride event. We loved it so much we decided to offer it up for everyone. If you have pride, are out, and out spoken… this is your shirt.